I had a question about Tire Irons and The Tool Bags or Tool Rolls. How many Tire Irons in the kit for a 1922? I have always only seen 1 in most kits but hear about two sometimes. 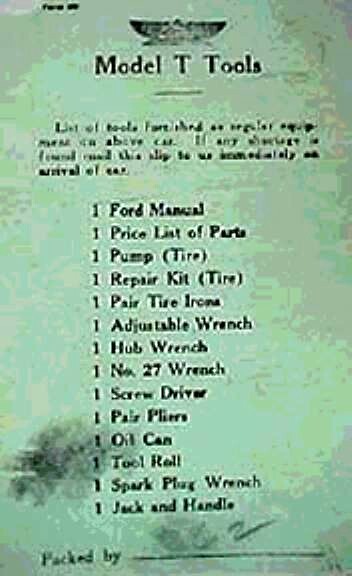 Are the Tire Irons Marked with Ford Script or the Ford Part Number? For the 1922 would it be the Tool Roll or the Tool Bag? This seems to be an area of confusion as well. Thanks for that Drawing Ken. I see it does show two Tire Irons which always made sense to me. "On December 6, 1920 a new design. It is now more of a bag than a roll. Apparently two versions were being made; one had a snap button to keep the flap closed and the other used a web strap. The button type appears to be new as the strap had been used for some time." Here is a picture of the Tool Roll I got from Lang's. It is very nice but a little different. I just noticed from your drawing that my tool pouch is cut backwards. The Pouch angles the wrong way. I checked the Lang's Picture on there website and there picture show the correct original cut bag. I called them up, just to let them know and they are going to talk to there manufacturer and see what happened. They were very nice to deal with and are going to ship out a correct one when they get them in. I don't think we'll ever get everyone to agree on tools, but in 1922 there are two tire irons with no Ford script. I believe they stacked them in the tool roll. 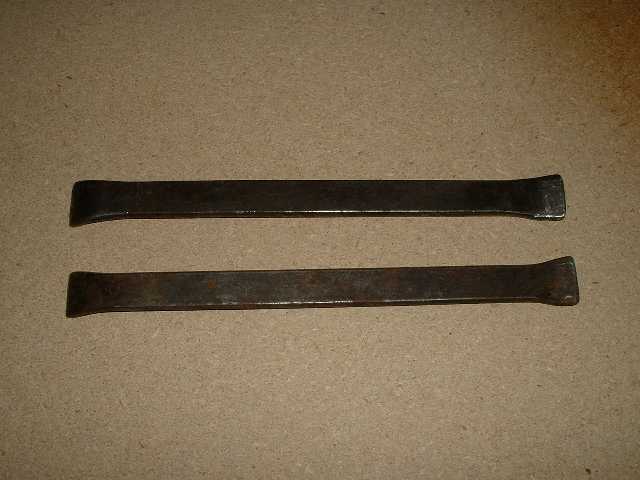 In 1925-27 they only supplied one tire iron, because the other one was the jack handle. Henry Ford would have reversed that cut on every other tool bag to reduce wasted material. Those were made for sale in the countries that bought RHD Model T Fords. Mark Cameron makes correct ones. Mark will refer you to Lang's--he's their supplier. 2335, 1917, and 1349 are easy. You see them all the time. 1387 and 1903 are a little more scarce. 2340 is hard to come by. 1902 is rare. It can be really expensive, or dirt cheap when somebody doesn't know what it is. 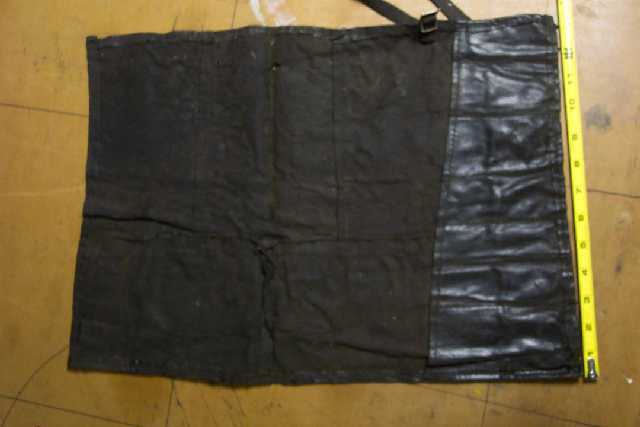 I am looking at an original tool roll I've had for years, and it is similar to the one pictured above, but the flap is NOT tapered. It is square. Larry what year do you believe your Tool Roll is? They made a few changes over the years according to the encyclopedia. Larry, yours sounds like the earlier 1914 version. My confusion comes toward the end where it states the roll became more of a bag in 1920. So what's is correct for a 1922 is it a Tool Bag or one like the Tool Roll from Langs and others? 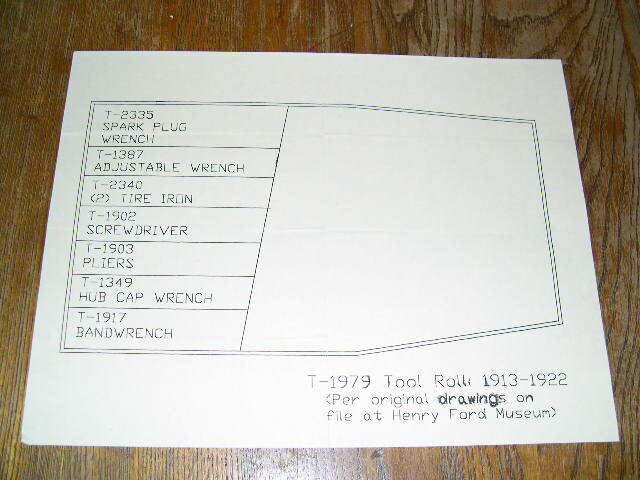 The earliest tool roll record is dated September 4, 1913. The drawing indicates it was factory number T-1979 and was made of six-ounce waterproof duck. It had pockets for the tools and was tied with a strap. The flap had beveled edges. The next change was on October 23, 1914 when the drawing was brought up to date as the rolls were then being made. 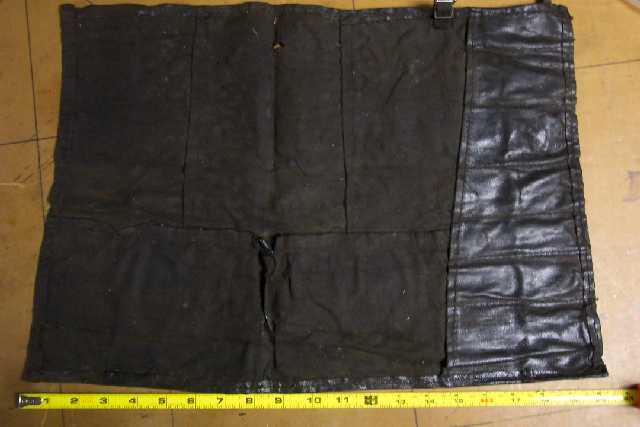 The size changed to 13 by 19 inches (from 14 by 20 inches) with the width of the pockets changed accordingly. A pocket was added to the flap to be used in holding T-4729 repair patch and four tire patches, T-4726. The corners of the flap are square instead of beveled. On March 3, 1915 the drawing was brought up to date as the rolls were being made at that time. The pocket in the flap was discontinued. On March 31, 1915 a note was added that the rolls were to be made from any scrap rubber or imitation leather, and were to be made by the Ford Motor Company. In December 16 (the date is obscure) the drawing indicates the pockets were discontinued. On December 6, 1920 a new design. It is now more of a bag than a roll. Apparently two versions were being made; one had a snap button to keep the flap closed and the other used a web strap. The button type appears to be new as the strap had been used for some time. On June 5, 1924 a new drawing. The width went from 5 to 6 inches to 5-1/2 to 6-1/2 inches, and the length outside went from 16 to 17 inches to 12-1/2 to 13 inches. 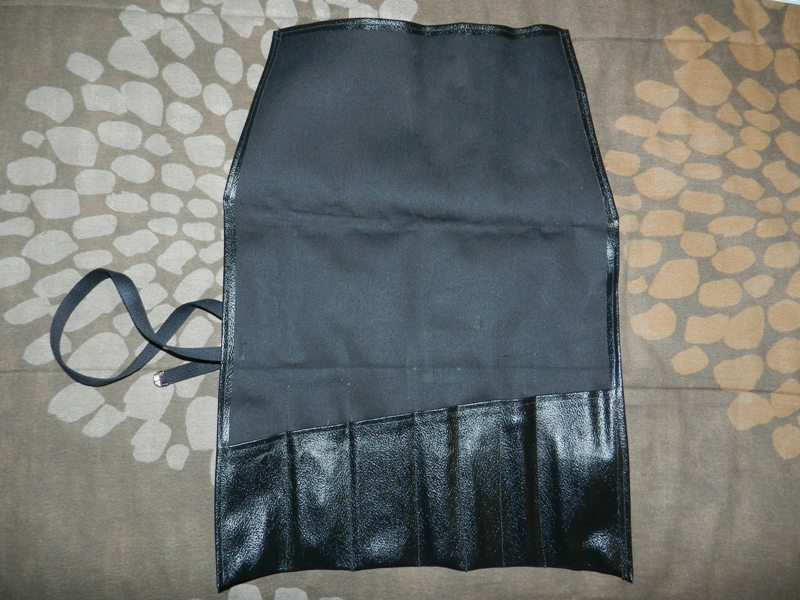 Glove fasteners were specified instead of the strap and buckle. You've hit the nail on the head Steve. "If they don't know". I've picked up 3 at local flea markets. Never more than $4.00 each. Their unmarked and that's probably the reason. Ford marked stuff commands higher $. I've never seen the tire iron. Anyone got a picture & dimentions? Pliers are tough. Adjustables and open ends much easier to find. You trip over the spark plug/head bolt wrench. Their like ants. Everybody has them. To my knowledge, the common bags you see frequently are for the Model A. I really can't say the year of the one I have, but I'd say it's late teens, or early '20s. When I got it, it still had 3 unused tools in it. In '24 or '25 for sure they did come out with a bag, but not the Model A type. I think Mark Cameron makes those too. They are like a real small golf bag, and the reason they introduced it is to hold the new style jack handle, which has a tire iron on one end. I have a NOS one of those too. I really like the late '25-27 bag, because you can carry an exhaust pipe pack nut wrench in it, even though it was not included with the car when new. Here is a photo of a real original Ford tool pouch. This one has a braided cotton strap. Mine is exactly the same, but it uses top material for the strap. Charlie B. said: "I've never seen the tire iron. Anyone got a picture & dimentions?" Here's a pair of 'em. They are 9&7/8" long, 7/32" X 3/4" material. Probably 10" long before being bent. They are shown in my 1917 parts book as part # 2340. They're also shown in the Model T Encyclopedia "1915-1917" list and also the "1925 and later" list. The 'cyclopedia also shows a different tire iron w/the same part in the "1912-1914" list. I had them given to me a few years ago along w/a bunch of old wrenches including a Cadillac script wrench. Thanks Ken. Non-descript unmarked. I'll know it if I see it. I suppose, like the screw driver, you have to go by dimentions. Up 'till about 1915 or 16 (don't remember now), the ends were curved toward the same side. Later, they were turned to opposite sides. I'm thinking I read that in the MTFCI Judging Guidelines book. Charlie, if you come across some irons the same size as those shown, and they have the Ford script, the T factory number, and Made in Canada all embossed on them, they can't be for a T can they? You had better send them to me!!! Just hoping. I need two more for my fourth T.
LOL Allan. like I said: if they had those 4 letters on them (Ford) they'd be pretty expensive around these parts! I may have actually seen a few over the years but never bothered because I didn't know they were un-marked.